Welcome back or should I say I’m back! I’ve had a bit of time off over the last few months let me explain… December had us all sick one after the other, day after day, xmas plans were thrown out the window and the festive season became the “Lets not pass this unpleasant gastro type thingy on to anyone!” Didn’t fancy being the bearer of that type of pressie! Then came the Christmas/Summer holidays consuming every bit of my energy I had trying to entertain 3 kidlets without them killing each other. On this very hot week in February/March I am sitting down in front of my computer for the first time in over two months (why I decided to make pastry is beyond me!). It feels a little weird to be here but well overdue. I’m starting off with a cracker. The only real cooking you have to do is the tart case and this can be done ahead of time. We are heading into Autumn here in the Southern Hemisphere and that means the last flourish of late berries making an appearance in particular Raspberries. Choose whatever you have available it tastes great with any of them. 1-2 Punnets Fresh Berries , Raspberries, Blueberries, Blackberries, Strawberries or a mix! Combine all the dry ingredients together , either by hand or in a mixer. And then add the butter in cubes. Rub with in with your fingers or pulse until you have the breadcrumb look. Add the egg yolk and mix through. Now this is the bit where you have to trust yourself…add some water to bring this all together. Start with 1 Tablespoon at a time, dribble this in while the motor is running. You will know when its done as it will start to form a ball and the mixer will be pushing it around the bowl. Stop, Wrap and Cool in the fridge for half an hour or so. Once you are ready to cook the base pop the oven on to 180*c and take the pastry out of the fridge and allow to come up to room temp. Roll the pastry out to about 3-4mm thick and line a tart tin. 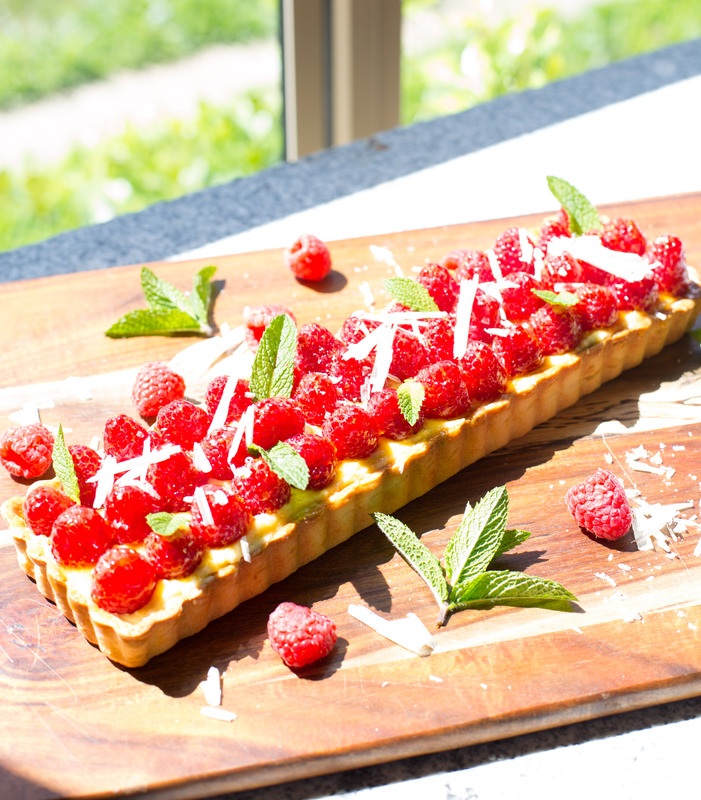 I used a 10cm/35cm rectangle tart tin. Prick the base with a fork and pop in the fridge for 10 mins. Once 10 mins is up and you’ve got the oven up to temp take a piece of baking paper and line this over the pastry, we are going to blind bake it now. Fill this will baking beans ceramic or use a bag of out of date dry beans or rice. Cook for 15 mins and then remove the baking paper and the beans and allow to brown up for another 5 mins. Cool completely before filling. At this point you can pop the tart case in an air tight container and will happily sit for a couple of days before you fill it. It couldn’t get easier than this. Pop the mascarpone into a bowl and break it using a whisk or use a stand mixer on very low. I’m looking for a smooth, lump free consistency. Add the lemon zest and the vanilla bean. Mix Gently. Now grab the melted white chocolate and as you are whisking dribble the white chocolate into the mascarpone. Mix until combined but don’t over mix. 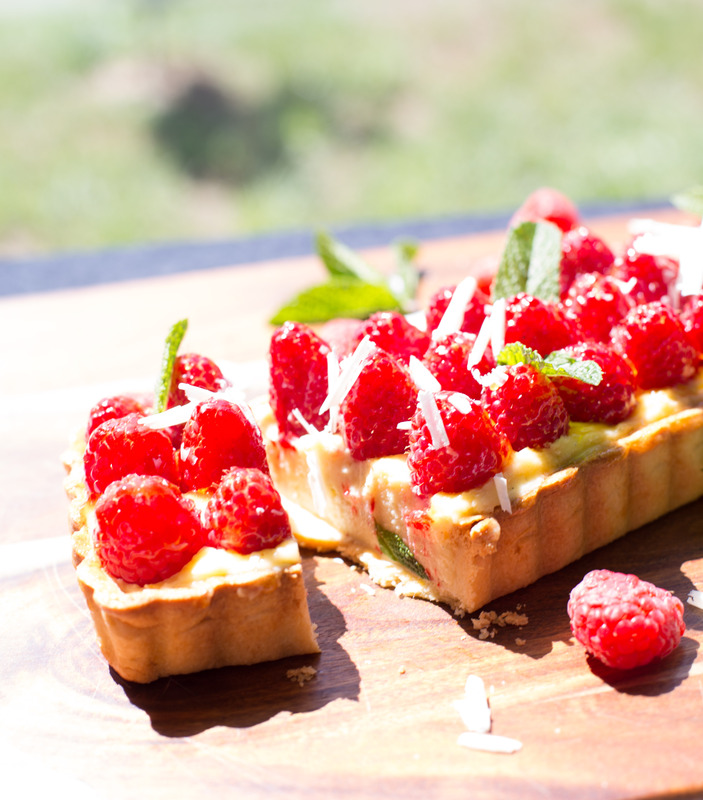 Take your prepared tart case, this bit is only OPTIONAL -take around 50gm of melted white chocolate and cover the tart bottom and sides creating a little layer of white chocolate. If you do this chuck it in the fridge for 10 mins to harden up and then carry on with the filling. 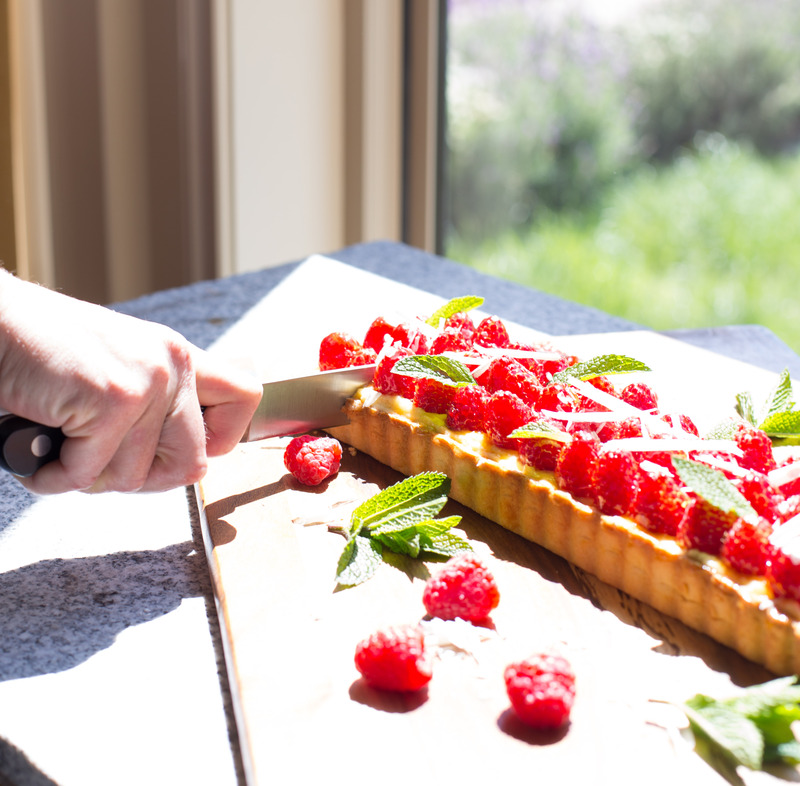 Pour the mascarpone and white chocolate mix into the tart case smoothing out so you have an even layer for those beautiful berries to rest. Decorate with your chosen berries. Again another OPTIONAL extra, take some smooth apricot jam and warm with a touch of water to make a paste and using a pastry brush paint this glossy amber mix over the berries. This brings the berries up to a lovely shine but if you don’t have time it will still look and taste great. Pop the tart in the fridge to firm up and when you are ready to serve top with some pretty mint leaves and curled shards of white chocolate and present to your guests (or yourself). Wonderful post: I love your photography, and I’m definitely going to try this recipe. Thanks Jacki! Its feeling really great being back! This looks amazing and sounds not too complicated! I just need to get the right tin and I’m away! Excellent, it is super easy and tastes yum!